**Update 1/28/2011** Congrats to our winner, Mary Virginia! Thanks to everyone for your great comments. I read every single one, and I can’t wait to dive into some of these wonderful reads. 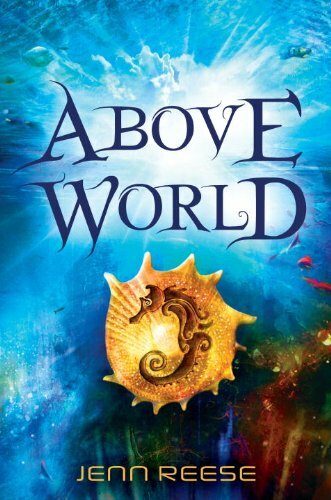 I’m very excited to be able to share an Advance Readers Copy of the amazing Above World by Jenn Reese. Thirteen-year-old Aluna has lived her entire life under the ocean with the Coral Kampii in the City of Shifting Tides. But after centuries spent hidden from the Above World, her colony’s survival is at risk. The Kampii’s breathing necklaces are failing, but the elders are unwilling to venture above water to seek answers. Only headstrong Aluna and her friend Hoku are stubborn and bold enough to face the terrors of land to search for way to save their people. But can Aluna’s fierce determination and fighting skills and Hoku’s tech-savvy keep them safe? Set in a world where overcrowding has led humans to adapt – growing tails to live under the ocean or wings to live on mountains – here is a ride through a future where greed and cruelty have gone unchecked, but the loyalty of friends remains true. I deeply love this book. I wish I could have read it as a 12- or 13-year-old. Kirkus calls it “Imaginative and riveting,” and says, “A warrior heroine with a caring heart, stalwart friends, an edgy futurist subtext and the suggestion of a possible sequel make this a thrilling sci-fi adventure.” I couldn’t agree more! To win this ARC, just comment by telling me a favorite middle grade read that I shouldn’t miss. After midnight EST on Friday, I’ll do a random number thingy and pick a winner. Good luck! Can’t wait to see your middle grade recommendations! I’ve really enjoyed the Middle-Grade Fablehaven series. This book looks amazing! I’d recommend The Cabinet of Earths, b Anne Nesbet 🙂 Thanks for the giveaway! The Unwanteds was just fabulous. Ohh I love the Skeleton Creek series by Patrick Carmen with the added online video feature it is awesome. Cannot wait for the summer when we are going to tour the actual dredge in Oregon! I have to go with Breadcrumbs by Anne Ursu. That book is magic. Or, if you want to be torn to shreds inside, A Monster Calls by Patrick Ness. It’s magnificent. You can’t go wrong with Kate Milford – read THE BONESHAKER, then later this year read THE BROKEN LANDS. A two-fisted dose of steamypunky brilliance. this looks awesome!! some middle school books i would recommend ( i think theyre middle school).. rick riordans percy jackson series… sarah prineas’ magic thief.. ursula vernons dragonbreath series.. holly blacks spiderwick chronicles… and hardy boys! cant mess with the classics! My favorite middle school read is The Magic Thief series by Sarah Prineas. Another fun series is Septimus Heap by Angie Sage. I really enjoyed Akata Witch by Nnedi Okorafor this past fall. Great read. I super loved Promise the Night by Michaela MacColl – it’s not fantasy but it was SO great! My all time favorite Middle Gray series is the Twitches series by Randi Reisfeld and HB Gilmour SO great. I loved Philip Reeve’s book, Larklight. So good! I sooooooooooooo love that cover. Did when I first saw it on my feed at LJ. Just beautiful! My favorite middle grade will, most likely, always be the Harry Potter series! Mm favorite middle grade series is the Fablehaven series by Brandon Mull. There are SO MANY, I really enjoyed the Percy Jackson Series. And many from Christopher Pike and R.L Stine. Thanks for the chance to win, the book sounds really good. i really liked a tale dark and grimm by adam gidwitz. it told the real story behind grimm’s fairy tales with hansel and gretel being a part of each one. and if you haven’t read the original pippi longstocking by Astrid Lindgren, it’s a good one too. Kaya, I live in WW and Patrick Carmen did a book signing for his new Dark Eden YA book. He was soooo great to the kids and talked a lot about the Land of Elyon illustrations and what’s coming up next. I want this! Thanks for this giveaway! Have you read The Land of Elyon series by Patrick Carman? After the first book, The Dark Hills Divide, my son decided he wanted to design video games so it could be MADD into a video game. He LOVED the series. No need to enter me in the contest–I have Jenn’s book pre-ordered!–but I wanted to recommend THE TRUE MEANING OF SMEKDAY by Adam Rex and THE CITY OF EMBER by Jeanne DuPrau. Yes, Eugene, I forgot those! I laughed my way through Smekday (J-Lo!) and re-read Ember about 3 times. in this technological globe all is existing on web?